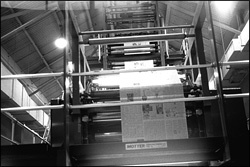 The Union Leader is the largest circulation newspaper in New Hampshire and is the only statewide paper. According to the Audit Bureau of Circulations, as of Sept. 30, 1998 the paper had a daily circulation of 64, 045 and the Sunday edition, the New Hampshire Sunday News, had a circulation of 86,973. Circulation has fallen in recent years for both the daily and Sunday editions (in Sept. 30, 1994 the figures were 69,694 and 100,321). The fact that other papers have introduced Sunday editions, whereas the Sunday News once had a clear field, has contributed to the circulation drop. Nonetheless, the Union Leader remains must reading for news on the state, and can be counted on to be in the thick of the primary campaign. For example, on March 1, 1999 the Union Leader announced a partnership with New England Cable News and New Hampshire Public Television "to revive substantive, high-profile, televised debates for New Hamphire's First-in-the-Nation Presidential Primary in 2000." 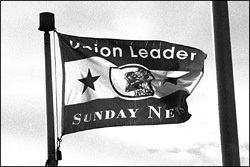 The Union Leader sells for a newsstand price of 50 cents daily and $1.50 on Sunday. The paper is published by the Union Leader Corporation, Nackey S. Loeb, president and publisher. Loeb, a granddaughter of E.W. Scripps of Scripps-Howard fame, took over when her husband William Loeb died in 1981. Mr. Loeb, a colorful, outspokenly conservative figure, had run the paper for 35 years. He wielded heavy hand in New Hampshire politics and was renowned for his blistering front page editorials. Under Mrs. Loeb the Union Leader retains a conservative editorial philosophy, albeit with less use of caps and exclamation marks than in Mr. Loeb's day. The conservative tone was evident in the paper's greeting to President Clinton during his February 18, 1999 visit to mark the anniversary of his "comeback kid" showing in the 1992 primary; a banner across the top of the paper proclaimed "Mr. President, you're a disgrace!" 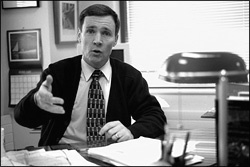 Joe McQuaid spoke with DEMOCRACY IN ACTION on February 9, 1999 in his office at the Union Leader. QUESTION What are your objectives and goals for covering the 2000 New Hampshire primary? What do you want to achieve? QUESTION And to achieve that goal what resources are you going to be throwing at that? Can you talk about your political team? QUESTION A lot of news organizations will have a planning meeting to figure out how they're going to do the coverage. Have you done such a meeting? QUESTION How about partnerships with other news organizations, for example to do polling? QUESTION You don't have an editorial board?? What do you tell the candidates? QUESTION Can you talk a little bit about that, the conservative attitude of your paper? At the L.A. Times, for example, you don't really see such an obvious ideological bent. QUESTION How about your publisher Nackey Loeb? QUESTION How does the political landscape up here now compare with the last two presidential primaries? QUESTION What does it take for a presidential candidate to (a) win or at least (b) do well in New Hampshire? What are your objectives and goals for covering the 2000 New Hampshire primary? What do you want to achieve? JOE McQUAID: Just provide the best information we can to our readers about who the candidates are on both sides of the fence, and what they have to say for themselves, and New Hampshire folks' reaction to them. Issues, etc. Where they're from. What they're saying when they campaign here, and what they're saying when they campaign elsewhere. Things like that. And to achieve that goal what resources are you going to be throwing at that? Can you talk about your political team? JOE McQUAID: We don't have a Team 2000 I'm afraid. [A not so subtle reference to WMUR-TV's coverage, delivered with a deadpan look]. We just have the biggest news staff bar none in the state of New Hampshire, which consists of our regular news reporters here and in Concord, which is the state capital. We also have 17 or 18 independent news correspondents around the state in various areas, from Coos to the sea, as we call it. Coos is a county up north, two umlauts. By independents, do you mean stringers? JOE McQUAID: Well they're independent contractors. They're more than stringers; they report pretty much on a daily basis for us on news events large and small within their geographic area. And when it comes to presidential candidates traipsing through, we often take copy for the correspondents as well. Charlie Perkins, who's my executive editor, tries, which is not possible, but tries to coordinate all this stuff so that we don't have six dewy-eyed new correspondents all going after the same person on the campaign trail when they're pretty much saying the same thing from one stop to another. And there is other news that we like to get in the paper as well. JOE McQUAID: Right now there's a huge issue facing the state in Concord, with a state Supreme Court decision from last year, in particular regarding financing of public education. And that is consuming the state legislature. It's very important, and we've thrown our resources very much at that rather than at presidential politics. For instance, John DiStaso, who's a senior political reporter, would normally have covered the Dole event [Elizabeth Dole's Feb. 8, 1999 speech to the Greater Manchester Chamber of Commerce], or part of it last night in Manchester, but he's just involved 180-percent in covering the Claremont situation, as its known, as is John Toole, our statehouse bureau chief, and Warren Hastings is the third member of our statehouse team. And they're all covering that. Plus they're being supplemented from people down here covering that. Tom Fahey, who's one of our business reporters, has done a lot of reporting on the New Hampshire Claremont situation. After April 1 presumably this may be settled? JOE McQUAID: No, I don't think it will be. I don't think it will be even intermediately settled until June sometime. They’ll stop the clock. I don't think the Court's going to throw everyone in jail on April 1st. But we still manage to cover the candidates as they come through. A lot of news organizations will have a planning meeting to figure out how they're going to do the coverage. Have you done such a meeting? JOE McQUAID: We've been covering New Hampshire primaries as a newspaper since the modern version began in 1952. We don't need a planning meeting to figure out how to cover them… It [campaign coverage] depends on day to day and what the news events are, and we have several reporters here who are very well versed in presidential politics and the campaign, and as events come along and candidates come along they get covered both in one-on-one interviews that are done here and interviews with the editors and on the campaign trail both here and elsewhere. How about partnerships with other news organizations, for example to do polling? JOE McQUAID: I think we're partnering on some presidential coverage, but that's still in its nascent stage. So you might be talking to a radio station or a television station about doing a partnership arrangement? JOE McQUAID: I'm not going to speak competitively on what we're doing with other news media until it's announced in our paper, and it hasn't been announced so I'm not going to say squat on that. We do try to accommodate radio and TV and print media who come in here from out of state once every four years, and sometimes they set up shop here the week or two before the election. We've had radio stations from California who've come in and done their talk shows from here; we had a Boston radio talk show team that came in here and did, I think a couple of days of their show from here. We have a regular partnership with New England Cable News. They're jointly owned by Hearst and the cable company, used to be Continental Cable, now it's MediaOne.... New England Cable News, they report live, I think, probably 12 or 16 hours a day from their headquarters in Boston, Needham really, and they have bureaus in the various states. And they're sort of a mini-CNN in reporting New England news. They do a pretty good job of it. And their New Hampshire bureau is about four doors down in my newsroom on the left. They have their own reporter who is up here. We just trade information back and forth, and get our name on once in a while. They'll interview our reporters on a weekly basis for some story that's upcoming in the weekend editions, for instance. And I imagine that we'll be doing some things with them relative to the presidential primary. We have a lot of candidates who come through here--they want to meet the editorial board of the paper. We don't have an editorial board. You don't have an editorial board?? What do you tell the candidates? JOE McQUAID: We tell them we don't have an editorial board, but they're welcome to come in and talk with us anyway. We're unusual in that regard. We don't have this group that sits around and throws dice and decides on endorsements. But you do have a highly noted editor. Can you talk a bit about him? What does he bring to your paper? JOE McQUAID: A feisty attitude, and a good grasp of the issues, and a conservative philosophy that's pretty much in line with that of the owner of the paper and myself. Can you talk a little bit about that, the conservative attitude of your paper? At the L.A. Times, for example, you don't really see such an obvious ideological bent. JOE McQUAID: What, on their editorial page you don't? They're sort of missing out aren't they? It seems to even get to the front pages of your paper. For example the Union Leader ran front page editorials endorsing Buchanan in '96 and maybe even '92. Whereas this is not something the L.A. Times would ever do. JOE McQUAID: Never say never regarding the L.A. Times. If Mr. Willis [Mark Willis, controversial publisher of the L.A. Times] thought it would make money for him, there would be an editorial on the front page every day. Well editorials on the front pages of papers used to be pretty standard, but they've fallen by the wayside. If we think there's something of particular importance and the publisher of the paper wants to have a front page editorial about it, then we put one out there. But it doesn't affect our news coverage at all. It's clearly labeled as an editorial, and one might argue, as I often do, that some papers have editorials on the front page, they just label theirs as news. How about your publisher Nackey Loeb? JOE McQUAID: Nackey Loeb. Great lady. What role does she play in your paper? JOE McQUAID: She owns it. She sets the editorial philosophy from longstanding deeply held beliefs, most of which she shared with William Loeb, her late husband, who owned the paper and was its most colorful publisher in this last century. Day to day she lives in Goffstown, which is one town over. She also owns a group of weekly papers independently of the Union Leader Corporation; she's involved with those as well. She writes an occasional editorial for the front page. She had one last week, week before. She also called me up on Friday, and according to her it was Reagan's birthday on Saturday and she ordered up a front page little editorial cartoon greeting for the president, of whom she was a great admirer. She's a granddaughter of a fellow named E.W. Scripps, whom you may have heard of--Scripps-Howard newspaper chain was founded by him. JOE McQUAID: I hope they're not too long. Ten years ago or so, when ergonomic became a big buzz word, RSI and carpal tunnel reared their ugly heads--repetitive stress injuries. I think its genetic more than anything. But the keyboards are much easier to hit than a typewriter, and you use a different series of muscles. This is leading to an anecdote about the L.A. Times. Somebody did a study and the percentage of people with RSI and carpal tunnel in the L.A. Times was higher than a lot of other places. An editor from another paper opined that that's because the stories in the L.A Times were four times as long as another paper. So naturally they would have this. That's semi-serious. That was in response to the idea of long profiles on people. I hope they're not too long, because (a) I don't think politics is of great interest to a lot of people any more and (b) they have other things to do with their lives. We try to give them information that is well written but isn't so darn long that they get bored by it. So do we do features on candidates? Yeah, we'll take different approaches to it. JOE McQUAID: Everybody. The competition these days for people's time and information source is everybody and everything, which doesn't mean that we don't partner with our competition--TV, print, etc. But it is everybody; it's the Internet, it's political apathy, it's the Concord Monitor, it's the TV stations, it's the Boston Globe, it's anything and everything. WMUR? Some say that they've eaten into you a bit, in that people rely on them for their news rather than you all. JOE McQUAID: I don't know how to quantify that, since they don't have circulation. They claim viewership, but they claim it in ways that are hard to fathom. I don't think that particular TV station has eaten into us so much as other papers who've finally wised up to having Sunday editions of their paper. In this state for a long time we were virtually alone in the field with a Sunday edition. And then all the other papers--Concord, Nashua, Keene, Dover--the light dawned on their heads that there was more time on the weekend; people took more time to read on Sunday. So they started Sundays. That more than anything has eaten into our circulation. And how has your paper's circulation been over the last five years? JOE McQUAID: Over the last five years it was up as high on a Sunday as 100,000 and is now in the mid -80s, which still leaves it by far the biggest paper in the state… Daily it's in the mid-60s. Again the biggest paper in the state. How does the political landscape up here now compare with the last two presidential primaries? JOE McQUAID: Did you go to the dinner last night? What did you think of Mrs. Dole's reception by the audience? I thought it was kind of lukewarm. It was nice at the beginning but then there was a long stretch when she was reading from her Who's Who biography, listing these platitudes. I thought people were sitting on their hands. I was trying to fathom why that was. It seemed to me there were long stretches where she had built in applause lines and would pause and there wouldn't be any. I think people are so jaded by politics now and same-old, same-old, that that's what's changed in the political landscape. That people are still interested in the glitz and the glitter and seeing the name candidate like Mrs. Dole, but the messages have turned people off. And I think its going to be that much more difficult this time around. Part of this is Clinton and the whole seamy mess in Washington. I think that it's going to be difficult for candidates to break through and win over people. They need to have tutoring by Jesse Ventura? JOE McQUAID: I could have told you, you could have told me within a few syllables what Mrs. Dole was going to day last night. And she wasn't going to break out of the box, and there wasn't going to be anything either profound or daring in it, because of what you just said. That's what's changed for me, I think in the political landscape. The political junkies still like to go around and see people, but the average guy--it's going to be interesting for me to watch, but I think it's going to be tough to break through. I think that's why McCain is of interest to people because he has been so bloody outspoken and a little bit against the curve on campaign fundraising and other issues. Plus he's not your average politician; he's spent a lot of time behind bars. I don't know how Bush is going to cut through this stuff if he comes up here. What does it take for a presidential candidate to (a) win or at least (b) do well in New Hampshire? McQUAID: You can win by doing well up here. By breaking through. The nice thing about New Hampshire--but it's getting tougher and tougher… New Hampshire's still a place where somebody with lesser name recognition, because the state is so small and has been so receptive in the past…that somebody can break through and do well, maybe not first place, but whoa, come out of nowhere. And if they have a message and it resonates with the people they can still do well. So what does it take for them to do well? They've got to have more than the usual message, especially this time around. More in what sense? More focused? More ideological? And is just message enough? McQUAID: No. They've go to have some personality to them. That's why I say I don't know how Bradley is going to do, because I heard he was boring. You need cerebral but celebrity at the same time. New Hampshire voters--I've heard there's a libertarian streak. McQUAID: New Hampshire voters are all over the bloody lot. I don't know how you pigeonhole them. As long ago as 1964, they're supposed to be big conservatives; they're going to go for Barry Goldwater versus Nelson Rockefeller. They went for a guy in a write-in, Henry Cabot Lodge, who never set foot in the state. That's a little secret, and you can't put this on your web site. You don't have to campaign here to win. Don't tell anybody. Should I put that in brackets? McQUAID: Brackets or karats. No, I mean for the most part, especially if you're lesser known, you've got to come up and shake hands. But Eisenhower won the first New Hampshire presidential primary and never set foot in the state. Henry Cabot Lodge wasn't even on the ballot in 1964 and won. That's what's nice and quirky about the New Hampshire primary.